SAN DIEGO, CA (US), January 2019 — Three-dimensional printed implants could one day help restore neural connections and lost motor function in patients with spinal cord injury. The implants, developed by engineers and neuroscientists at the University of California San Diego, are soft bridges that guide new nerve cells to grow across the site at which the spinal cord has been severed. The work has so far shown promise in rats with severe spinal cord injury. Researchers published their work recently in Nature Medicine. The implants are hydrogel structures that can be rapidly 3D printed into different sizes and shapes, making them easily customizable to fit the precise anatomy of a patient’s spinal cord injury. Researchers fill the implants with neural stem cells and then they are fitted, like missing puzzle pieces, into sites of spinal cord injury. New nerve cells grow and axons — long, hair-like extensions through which nerve cells pass signals to other nerve cells — regenerate, allowing new nerve cells to connect with each other and the host spinal cord tissue. “Using our rapid 3D printing technology, we’ve created a scaffold that mimics central nervous system structures. Like a bridge, it aligns regenerating axons from one end of the spinal cord injury to the other. Axons by themselves can diffuse and regrow in any direction, but the scaffold keeps axons in order, guiding them to grow in the right direction to complete the spinal cord connection,” said co-senior author Shaochen Chen, Ph.D., professor of nanoengineering at the UC San Diego Jacobs School of Engineering and faculty member of the Institute of Engineering in Medicine at UC San Diego. 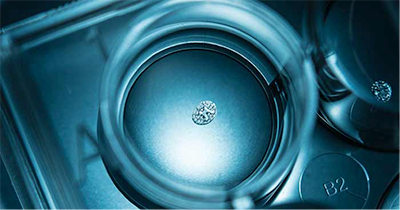 3D bioprinting experts in Dr. Chen’s lab teamed up with neural stem cell biology experts in the lab of Mark Tuszynski, M.D., Ph.D., professor of neuroscience and director of the UC San Diego Translational Neuroscience Institute, who is also co-senior author on the study. “In recent years and papers, we’ve progressively moved closer to the goal of abundant, long-distance regeneration of injured axons in spinal cord injury, which is fundamental to any true restoration of physical function,” said Dr. Tuszynski. “The new work puts us even closer to the real thing because the 3D scaffolding recapitulates the slender, bundled arrays of axons in the spinal cord. It helps organize regenerating axons to replicate the anatomy of the pre-injured spinal cord,” added co-first author Kobi Koffler, Ph.D., assistant project scientist in Dr. Tuszynski’s group. The implants contain dozens of tiny, 200-micrometer-wide channels (twice the width of a human hair) that guide neural stem cell and axon growth along the length of the spinal cord injury. The rapid 3D printing technology that Dr. Chen’s team developed produces 2-millimeter-sized implants in just 1.6 seconds. Traditional nozzle printers take several hours to produce much simpler structures. And the process is scalable to human spinal cord sizes. As a proof of concept, researchers printed 4 centimeter-sized implants modeled from MRI scans of actual human spinal cord injuries. These were printed within 10 minutes. Researchers grafted 2-millimeter implants, loaded with neural stem cells, into sites of severe spinal cord injury in rats. After a few months, new spinal cord tissue had regrown completely across the injury and connected the severed ends of the host spinal cord. Treated rats regained significant functional motor improvement in their hind legs. For more than a decade, Dr. Tuszynksi and colleagues have steadily progressed toward the ultimate goal of restoring function in people after a severe spinal cord injury. Previous published research, based on stem cell-based therapies, established the concept and potential. Along the way, they also upended dogma about how neurons grow. Meanwhile on the engineering side, Dr. Chen’s team has been developing a next-generation 3D bioprinting technology capable of producing detailed microstructures that mimic the sophisticated designs and functions of biological tissues. His lab has used this technology in the past to create life-like liver tissue and intricate blood vessel networks. One of their ongoing projects involves printing heart tissue for people who have suffered a heart attack and for treating other cardiac diseases. Drs. Chen and Zhu have co-founded the startup, Allegro 3D, to commercialize their rapid bioprinting technology. 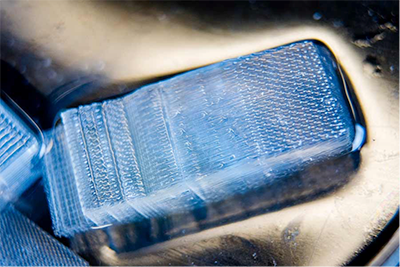 A 3D printed, 2-millimeter implant used to heal severe spinal cord injury in rat models. Image courtesy of UC San Diego. A larger (4 centimeters) implant modeled to fit an actual human spinal cord injury. Image courtesy of UC San Diego.